With the increasing number of people love to do shopping via the internet, E-Commerce creative applications have gained the admiration of people all over the world. Nowadays, every retail shop is planning to have a website or mobile app. If you’re one of them who are looking for the best E-commerce solution for your business, get in touch with Penta Techsoft Solution. Our Ecommerce web development services offer a great convenience to the retail owners for tracking, analyzing and management of inventory. We’re a team of cutting edge UI/UX designers and expert web developers who are passionate to provide you all of the necessary design, development and internet marketing services needed to be successful online presence of a business. We implement a unique development approach with a combination of advanced software technologies to ensure the overall success of our clients’ businesses. As a specialized Ecommerce application development company, we believe in offering the niche-specific solutions. 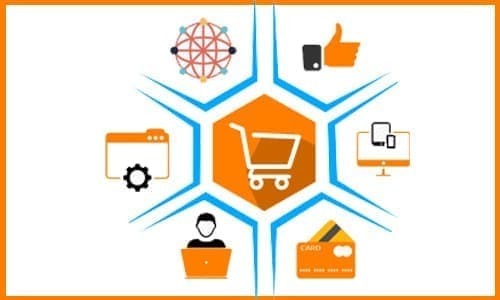 We design innovative, responsive, user-friendly and search engine friendly websites for all popular shopping carts, such as Shopify, Magento, BigCommerce, WooCommerce, and OpenCart. Our interactive E-commerce solutions not only generate sales but also enhance the profits of all kinds of businesses. Let’s have a look at our Ecommerce services! If you want to design a creative application for your retail shop, contact Penta Techsoft Solution . Our Shopify designers & developers carefully understand your all requirements and help you in getting full advantage of Shopify platform. Our Shopify Ecommerce development services guarantee to keep your online store simple, flexible and lucrative. Through our unique Shopify solutions, you can easily target your customers on social media and smart devices and you’re your products on all sales channels. OpenCart is another E-commerce platform which is quick to set up and easy-to-understand development approach. Are you’re in need of intuitive design and development solutions for OpenCart? Give a call to Penta Techsoft Solution to make your business stand out from the crowd. Establish your online store through our advanced WooCommerce design services. Penta Techsoft Solution is a full-service WooCommerce store development company which employ specialized developers. Our dedicated web team is always ready to serve you. So, hire customized and plugin development services and capture the market. From the personal blog to the marketing of your store, Penta Techsoft Solution offer best possible solutions for everything in WordPress. Our main focus is on site designing, theme customization, plugin development, and 3rd party integrations (API) to deliver you the best Ecommerce application solution. SEO or Search Engine Optimisation – is the process of improving a website’s ranking in the organic listings of the major search engines for a set of keywords. By improving the ranking of a website you attract more traffic which should ultimately lead to more enquiries and sales. Broadly speaking SEO can be broken down into two categories; on-site SEO and off-site SEO. We employ bright, talented people from a broad range of backgrounds including: Journalism, PR, New Media and English/Creative writing and our Off-Page SEO team is currently our biggest, employing over 50 full-time staff at our Leeds HQ.